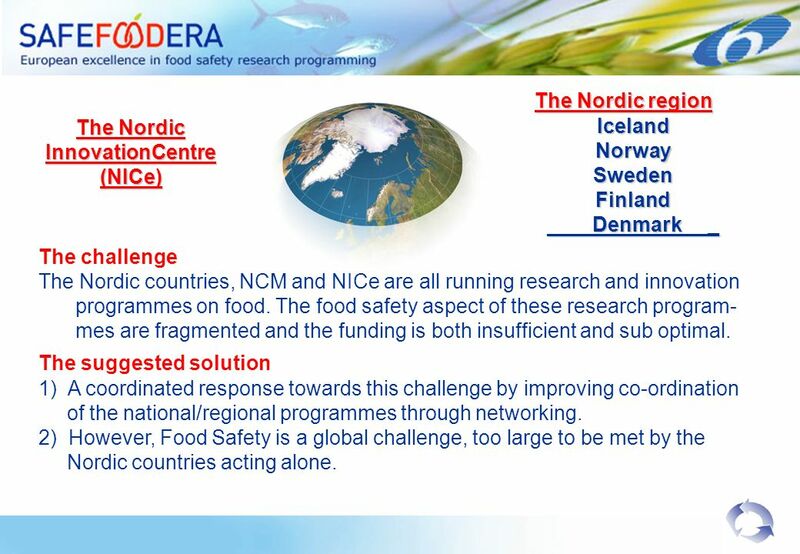 2 The Nordic InnovationCentre (NICe) The Nordic region The Nordic regionIcelandNorwaySwedenFinland Denmark _ Denmark _ The challenge The Nordic countries, NCM and NICe are all running research and innovation programmes on food. 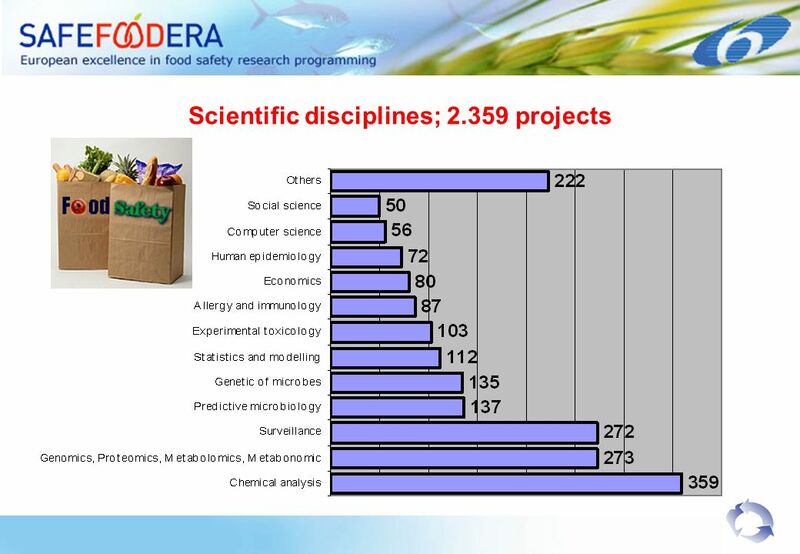 The food safety aspect of these research program- mes are fragmented and the funding is both insufficient and sub optimal. 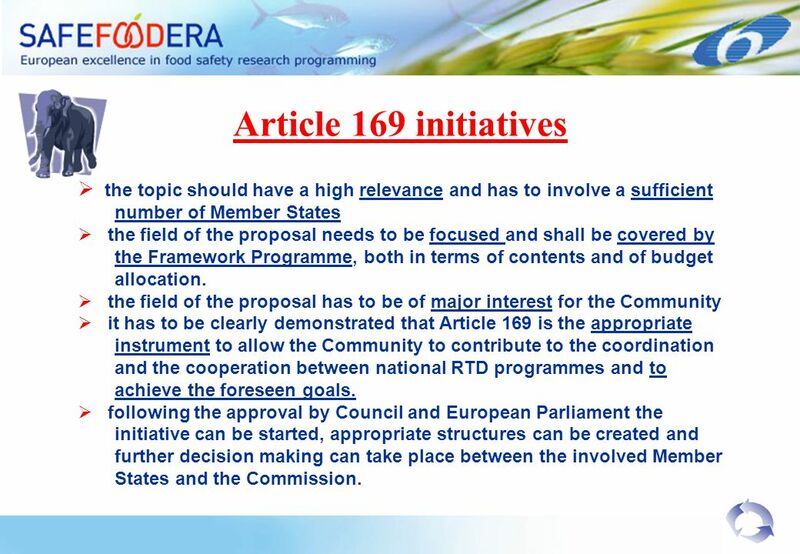 The suggested solution 1) A coordinated response towards this challenge by improving co-ordination of the national/regional programmes through networking. 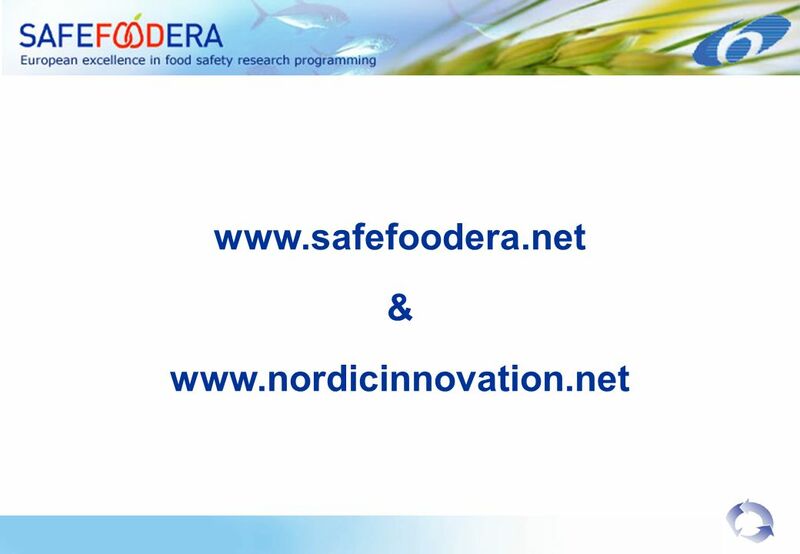 2) However, Food Safety is a global challenge, too large to be met by the Nordic countries acting alone. 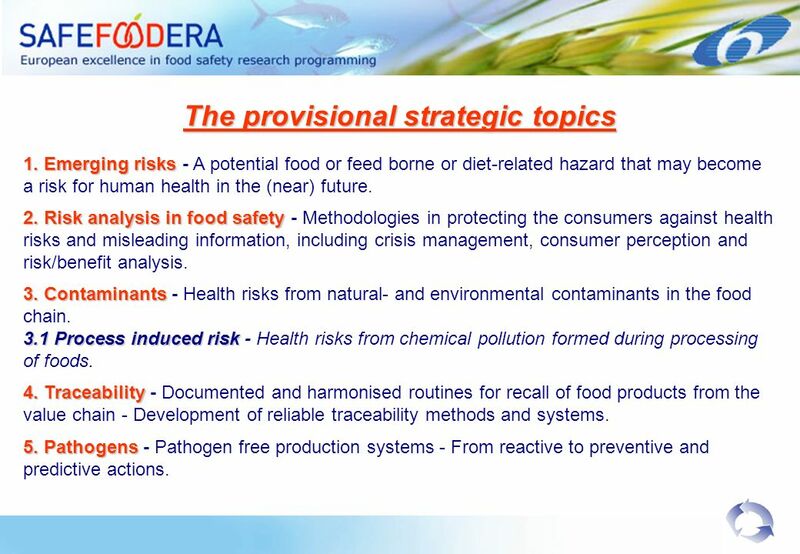 6 The provisional strategic topics 1. 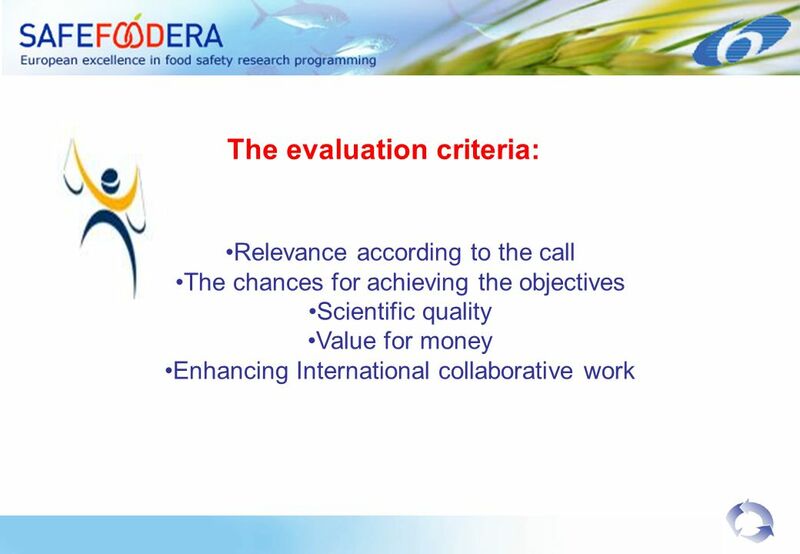 Emerging risks 1. 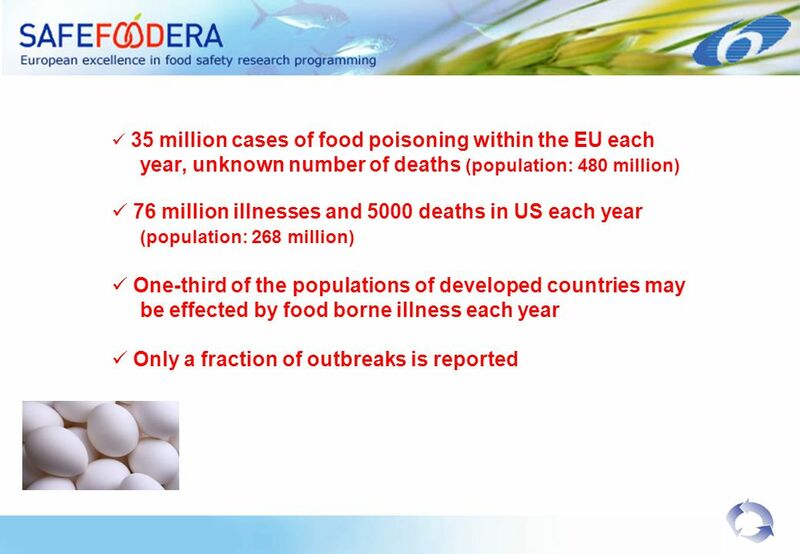 Emerging risks - A potential food or feed borne or diet-related hazard that may become a risk for human health in the (near) future. 2. 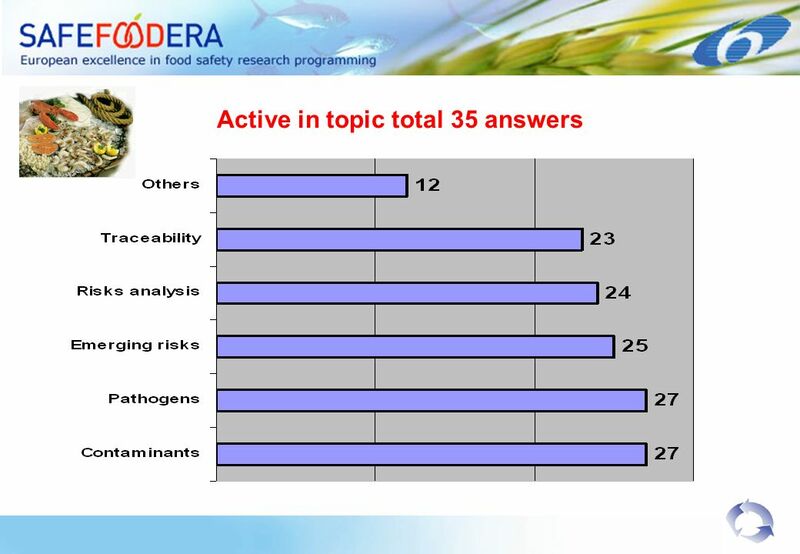 Risk analysis in food safety 2. 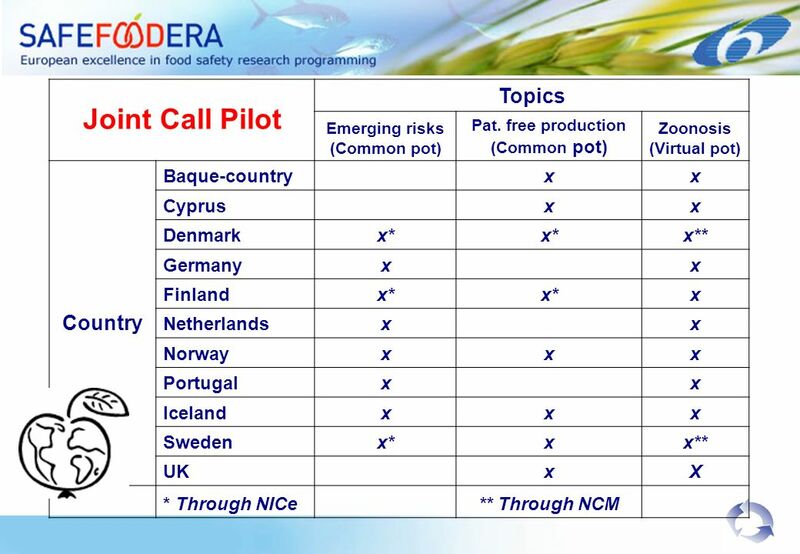 Risk analysis in food safety - Methodologies in protecting the consumers against health risks and misleading information, including crisis management, consumer perception and risk/benefit analysis. 3. Contaminants 3. 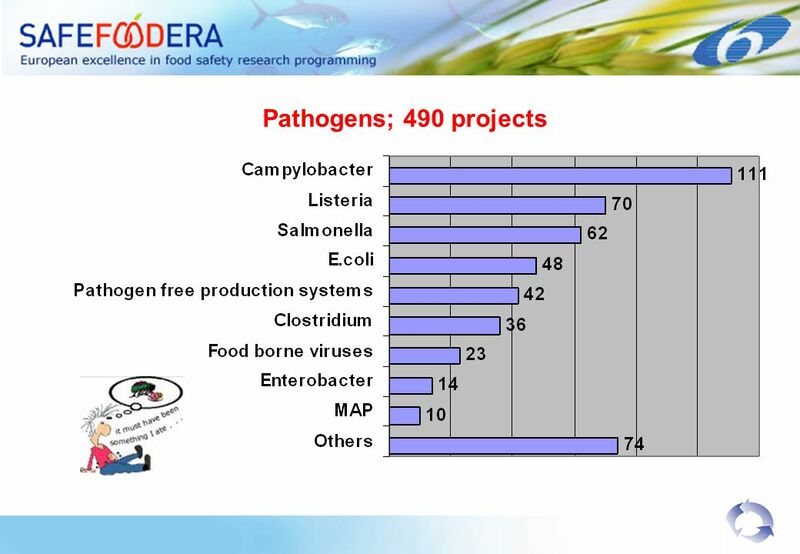 Contaminants - Health risks from natural- and environmental contaminants in the food chain. 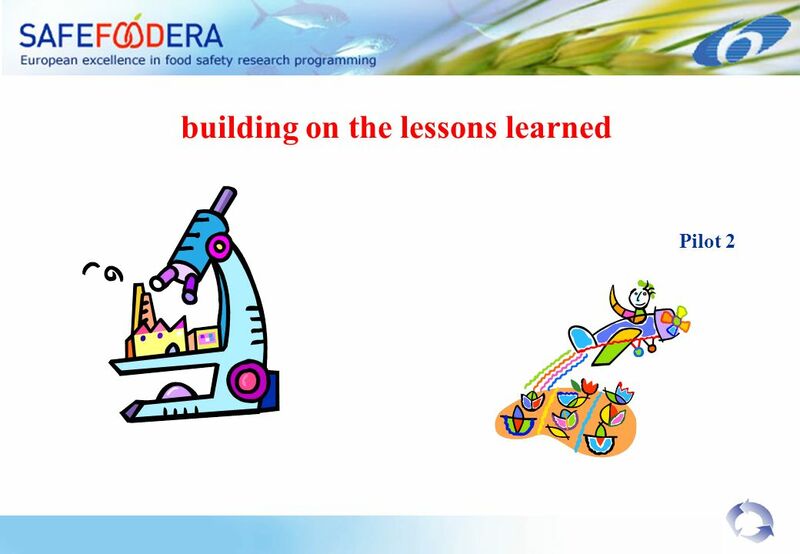 3.1 Process induced risk 3.1 Process induced risk - Health risks from chemical pollution formed during processing of foods. 4. 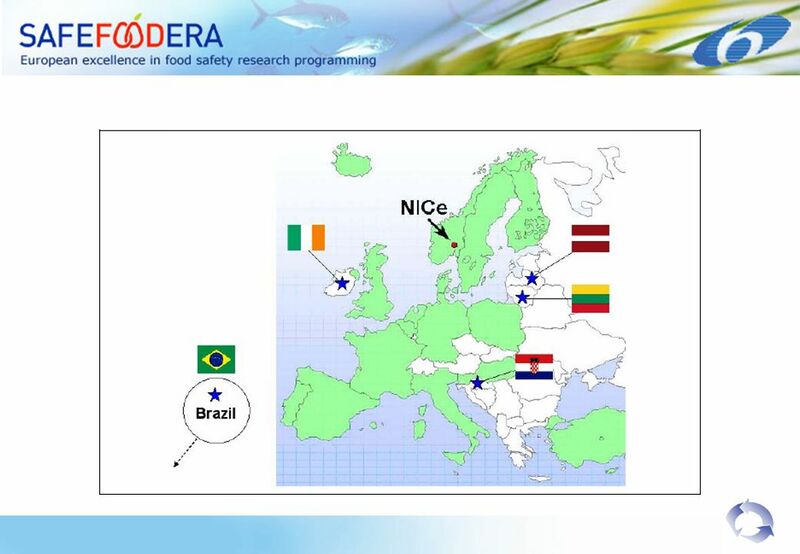 Traceability 4. 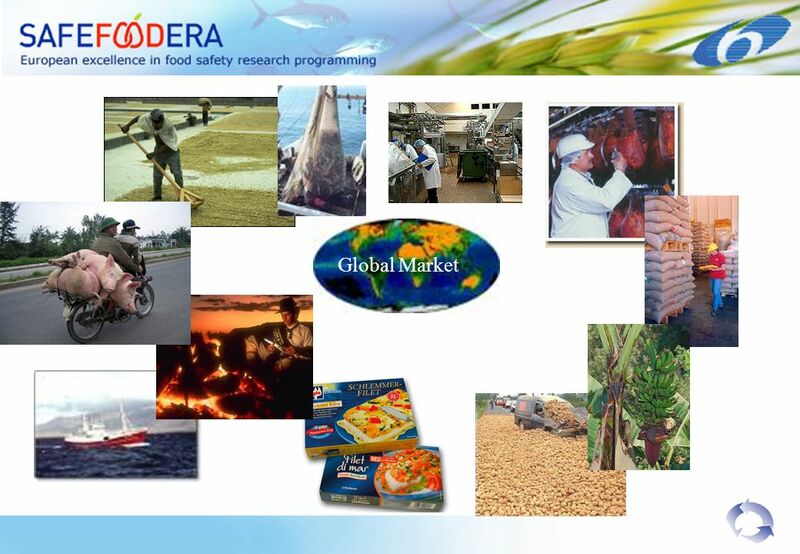 Traceability - Documented and harmonised routines for recall of food products from the value chain - Development of reliable traceability methods and systems. 5. Pathogens 5. 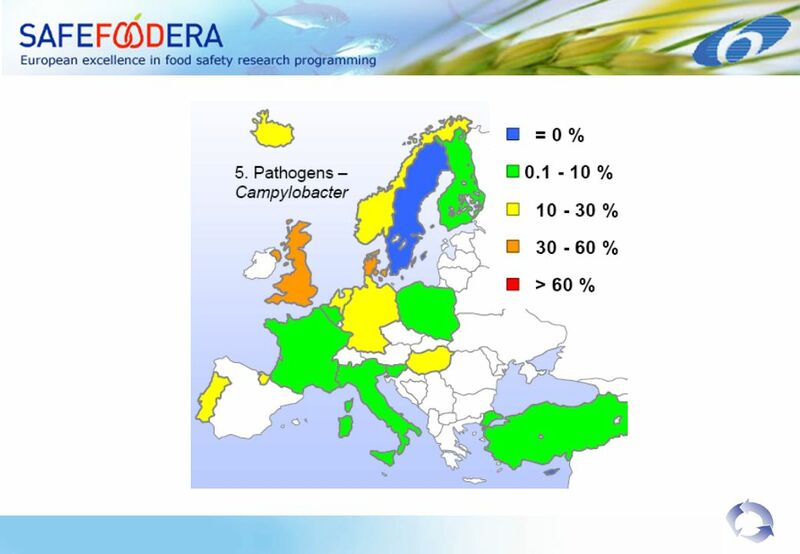 Pathogens - Pathogen free production systems - From reactive to preventive and predictive actions. 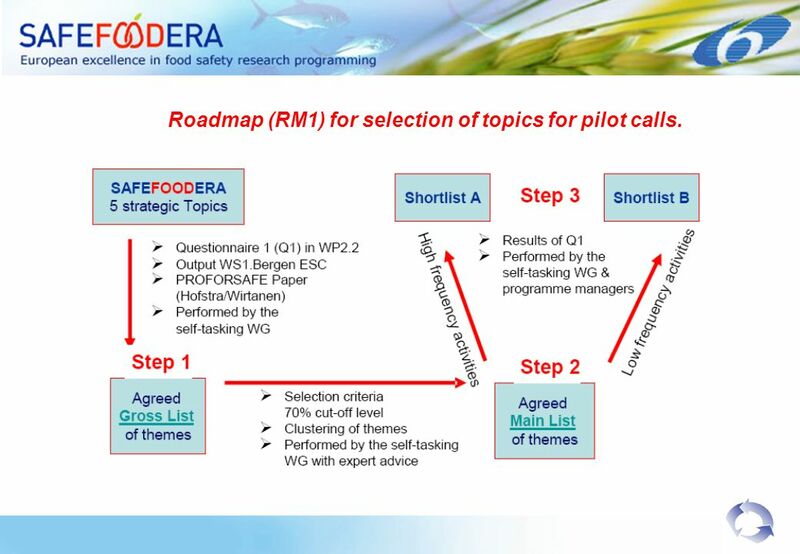 11 Roadmap (RM1) for selection of topics for pilot calls. 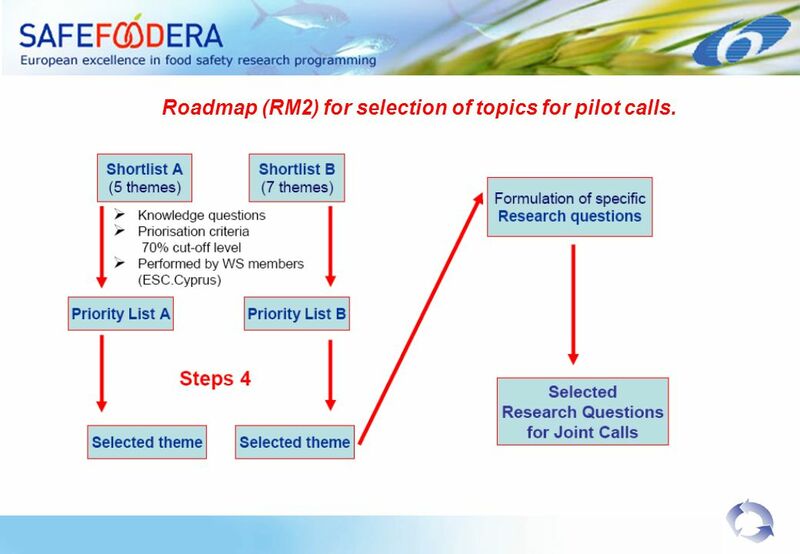 12 Roadmap (RM2) for selection of topics for pilot calls. 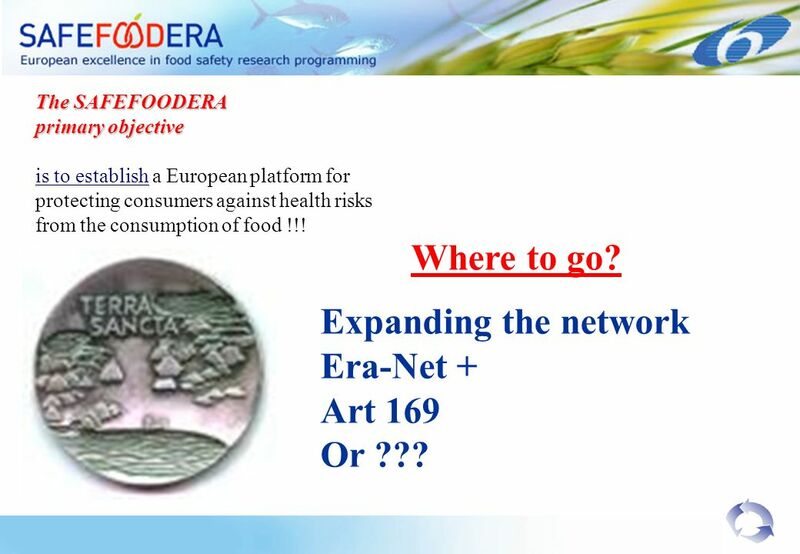 19 Expanding the network Era-Net + Art 169 Or ??? Where to go? 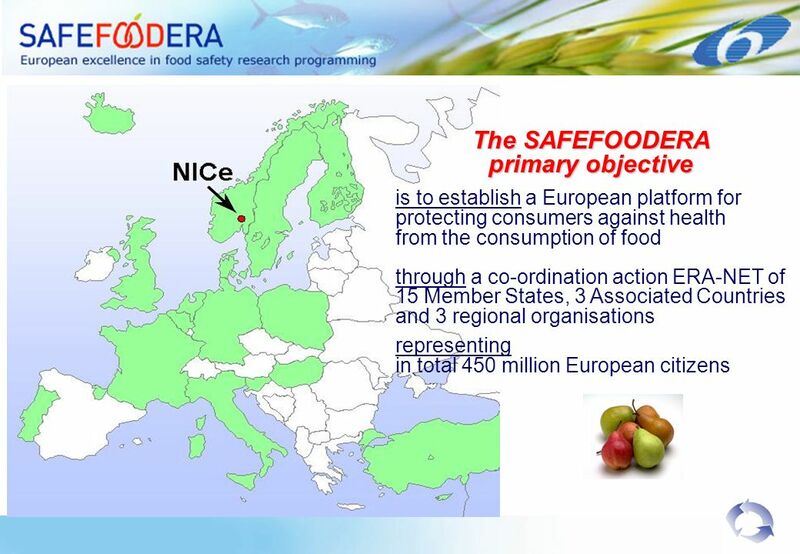 The SAFEFOODERA primary objective is to establish a European platform for protecting consumers against health risks from the consumption of food !!! 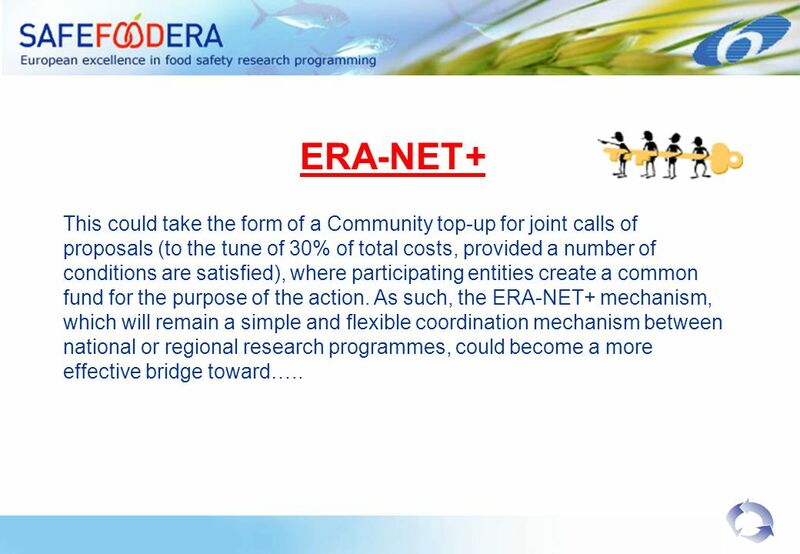 21 ERA-NET+ This could take the form of a Community top-up for joint calls of proposals (to the tune of 30% of total costs, provided a number of conditions are satisfied), where participating entities create a common fund for the purpose of the action. 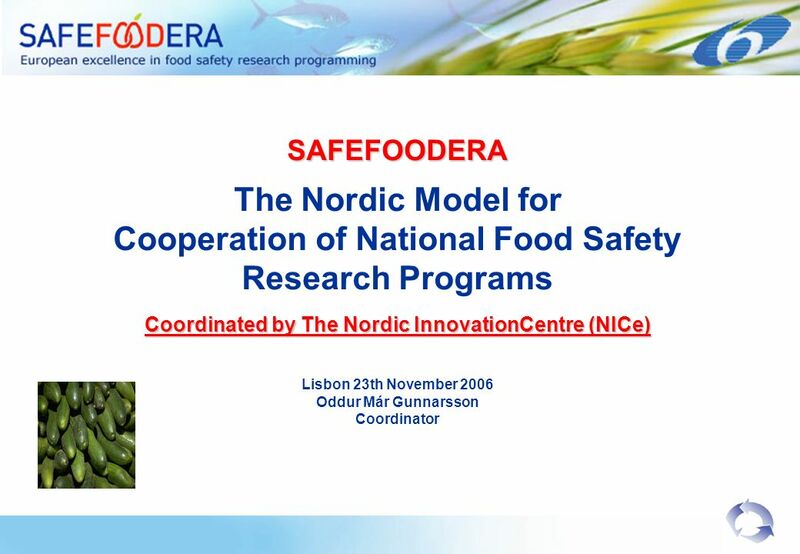 As such, the ERA-NET+ mechanism, which will remain a simple and flexible coordination mechanism between national or regional research programmes, could become a more effective bridge toward…..
Download ppt "SAFEFOODERA The Nordic Model for Cooperation of National Food Safety Research Programs Coordinated by The Nordic InnovationCentre (NICe) Lisbon 23th November." Support for the coordination of activities 1 Joint EuroHORCs - European Commission ERA-NET workshop Markku Warras Acting Head of Unit Directorate General. 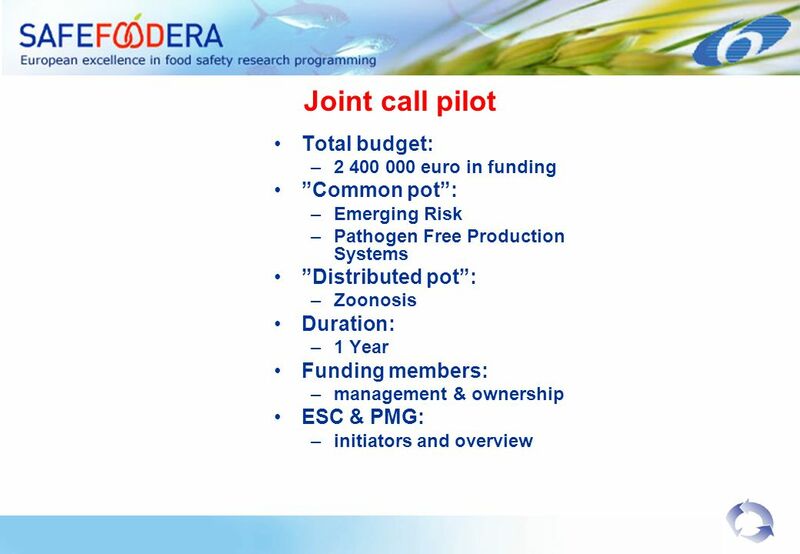 ERA-NETERA-NET 1 First lessons learned from an overview of joint calls under FP6 ERA-NET projects First lessons learned from an overview of joint calls. 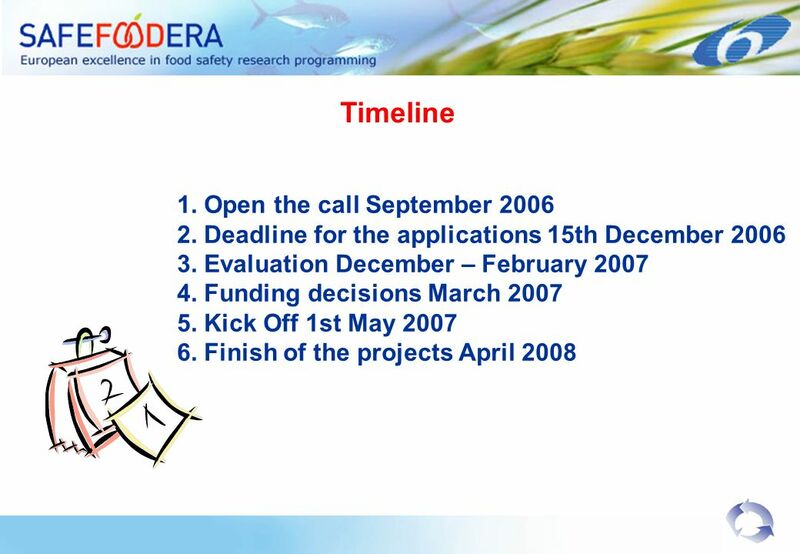 SAFEFOODERA Approval of the agenda Taking stock and future plans Oddur Már Gunnarsson Scheveningen the 28 th September 2006. 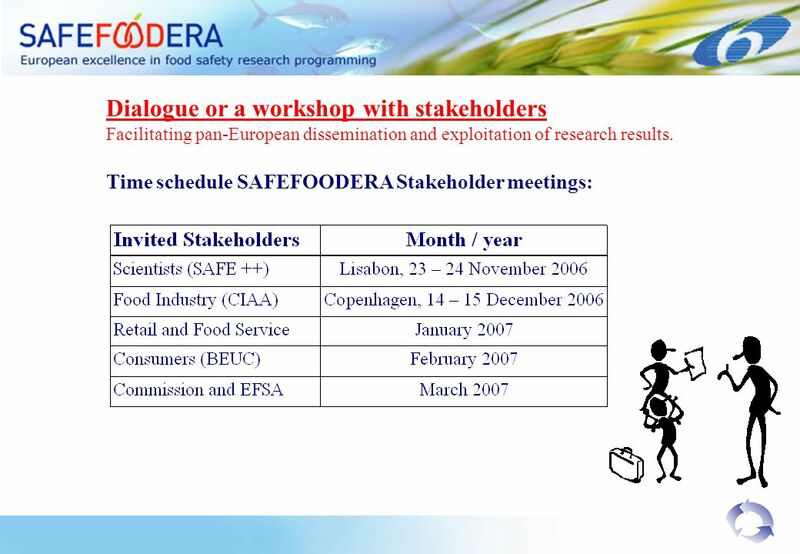 SAFEFOODERA Stakeholder Group meeting with scientists Lisbon, November 2006.